Those crazy Finns in Finland! Throughout the summer Finland plays host to a range of weird and wonderful festivals. From rock to classical, puppet theatre to contemporary dance there is something for everyone. Then there are the festivals that are a little more unusual and allow visitors a unique insight into the more ‘out there’ aspects of Finnish culture. Either way these are great events to get involved in or simply watch! Naked Run of Finland, 17 June, Padasjoki, North of Helsinki. 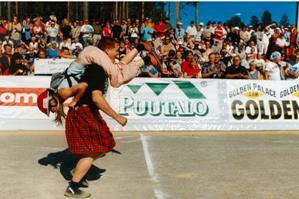 Wife Carrying World Championships 1-2 July Sonkajärvi, Northern Savonia. Hay-mowing World Championships, 2 July, Liminka, in the province of Oulu. Air Guitar World Championships 24-27 August, in the province of Oulu. Mobile Phone Throwing World Championships, August, Juva, Eastern Finland.